Football, bonfires, and sweater weather is upon us and as the fall season gets underway, we’re gearing up for the start of our annual Aftermath K9 Grant. Last year, the level of community participation far exceeded our expectations. Many readers nominated and voted for their local favorites. They followed our blog and kept an eye on social media, tracking their local department as we narrowed down the top contenders. Eight grants, totaling over $16,500, were awarded in 2017. It was an exciting race, and we’re expecting an even bigger turnout this year. While this year’s contest doesn’t begin until October, you can get a head start by checking out our previous years winners. Learn a little about the dogs, and get ready for next month – when your department could become the newest addition to our K9 Hall of Fame! The winner of our 2018 K9 grant came directly from the heartlands of central Illinois. Pekin, IL is a town of 35,000 people, located in Tazewell County. The town is best known for its Marigold Festival, hosted over Labor Day weekend. It is also home to the Federal Correctional Institution, Pekin (FCIP), a medium-to-low security institution which houses over 1,200 inmates. 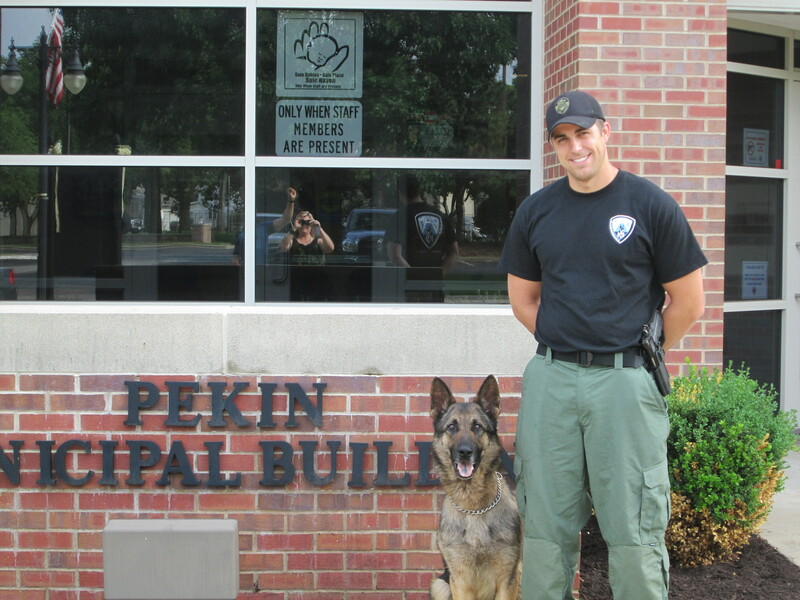 Protecting the Pekin community is a police force of 56 officers, including K9 Officer Ahen and his partner, Officer Rob Jones. The Dutch Shepard has worked with the Pekin PD for 5 years, since he was just 2. He was born and trained in Turkey, which is where he gets his unusual name. The K9 and his partner are assigned to routine patrol, but Ahren’s multi-dimensional skillset is called upon in many situations. He has a nose for narcotics, tracking, and suspect apprehension. He is also proficient in crowd control – when Officer Jones is facing one way, Ahen knows to face the opposite direction so he always has his partner’s back. In 2016, Pekin came in a close second to the top dog, K9 Clint of Alamogordo, NM. In 2017, he secured the 1st place seat with over 33,000 votes! Whether your local police already has a K9 Unit, or they’re hoping to add one soon, the Aftermath K9 Grant is a great way to support their efforts. This October we’ll be giving away another grant to one lucky organization, for either the creation or maintenance of a K9 unit. Be sure to keep an eye on our blog, and on Facebook and Twitter, for the full rules and up-to-date announcements. Aftermath’s annual K9 Grant is just one aspect of the Aftermath Cares program, aimed at honoring first responders for their ongoing efforts to protect and improve their communities. For more information on this program, visit our website.